Fitzpatrick’s Bar and Restaurant have done it again. 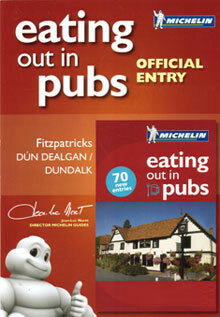 For the fifth year running they have earned a place in the Michelin Eating Out Guide. Executive Chef, Cathal Grant is a major factor in achieving this award. Under his direction, Cathal’s team have proven themselves in maintaning the standards that won them the award initially. Consistently providing Great food and fantastic service, their skill and finesse is evident on every plate that emerges from his kitchen. Fitzpatrick’s is one of only a handful for Ireland and the only one in Louth. As usual, the guide praises the hearty meals, great service, attention to detail and the fabulous gardens. Inclusion in the guide is seen as the highest honour in the food industry and to be included five years in a row is phenomenal. According to Danny Fitzpatrick, retaining your place in the guide is more difficult than initially winning a place, so to have achieved inclusion again is truly a testament to the hard work and dedication of the Fitzpatrick’s team.